Home Digital Marketing How Voice Search Optimization is Going to Change your Business Growth Strategies? 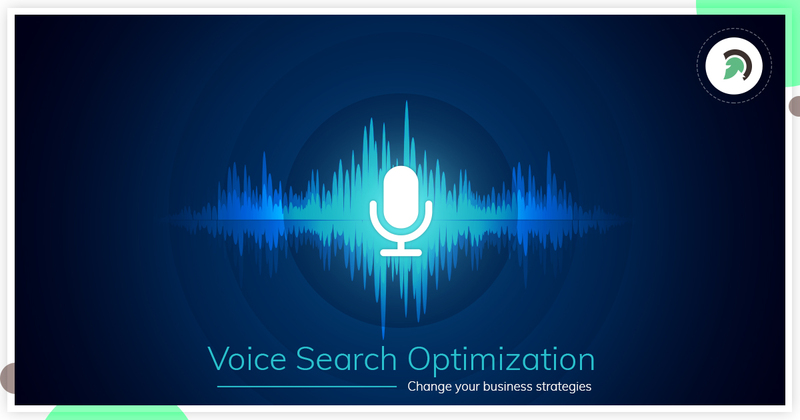 How Voice Search Optimization is Going to Change your Business Growth Strategies? Voice search is a promising technology that allows people to access search results on the Internet with just one smart device and their voice. As it seems, there are many services integrated as such by Google Assistant which you will find on every Android phone (By saying “Okay Google”) or SIRI in IOS Devices like apple smartphones or iPad. Even Amazon jumped on the trend with the launch of Alexa, an intelligent home assistant enabled by voice search. Launching programs and setting to-Dos on your smartphone like alarm, memo, etc. Looking for content in audio or video files. Let us understand now how voice search works, mentioned below is the workflow of a voice assistant which uses the user interface to show the most accurate results. A user initiates a voice search by pressing a key or speaking to the voice assistant of the device using a pre-programmed voice command (“Hey Siri”, “Ok Google”, “Alexa”, “Hey Cortana”). The user asks a question or gives a command, For example. “When will the Avengers movie come out?” Or “Release date of the movie Avenger”. Depending on the type of technology used by the speech search system, it collects words or phrases or complete sentences. The voice search system translates these sound units into text and then starts this search as if searching for a text. How is voice search changing definitions of SEO? Since voice search is a much simpler process than writing an application, the number of users has grown steadily in recent years. This effect is associated with the increase in the number of people with a smartphone and, consequently, an increase in mobile search. In fact, users are now more likely to use their mobile devices than their laptops or desktops when requesting information. A study by North star Research found that 55% of youths use voice search every day and 56% of adults use voice search because they can feel “technical”. The same people do voice search mainly to get directions. This phenomenon is not surprising, considering that voice search is much easier than typing. In fact, the search becomes more natural when pronounced aloud. Most of us are looking for quick hacks, tips, tools or how to render articles, and to do this digital assistants or voice search are the perfect tools. In addition, voice search on mobile devices increased up to three times as compared to desktop searches, as mobile users regularly search for information when the location is enabled. This provides a great opportunity for businesses and website owners to rank local voice searches. Local businesses can do some quick Search Engine optimizations to stay competitive. One of the positive aspects of voice search is that we tend to use it when we are looking for something specific and instant. It is more likely that people use a desk search to find something they want to investigate and take the time to study. A voice search helps us to make a quick decision about what we are looking to buy or any relevant information for specific products. The person who is doing voice search is more likely to make a purchase than those looking for information on a desktop. We search for products or services through voice search when we need at the time, such as a nearby restaurant to order food or household items that need to be repaired. Optimizing voice search means that your business will get the best results when customers want to make a purchase. Today most people rely on PDAs and other ways to find a voice for their queries, so businesses should be mindful of integrating language optimization strategies so they do not fall behind. Only Keyword Optimization means that you miss a significant amount of research that could attract customers directly to you. By focusing at least part of your marketing strategy on voice search, you can regularly attract new customers. Backlinko conducted a comprehensive analysis of the “Voice search ranking factors” and identified 7 different variables in the Google Home results. The company reviewed 10,000 results followed by the voice search. Website Page Speed is a major factor; voice search results typically show results from faster-loading pages. Google trusts deeply on very authoritative domains for results but pages not new domains. Content that ranks well on the google text search on desktop or pc tends to rank in voice search also. The schema is also a factor: ‘36 percent of pages’ voice search shows came from pages using Schema. HTTPS is essential for voice search rankings. Approximately 41 percent of voice search results come from Featured Snippets. Voice search results are generally 29 words; however, Google sources voice results range from long-form content. Since the mid-1990s, search engines have been introduced, users have learned to type brief keywords to search for information on the Internet with a PC. Unlike search keywords you enter on your computer, voice search is a more natural and understandable sound. Language research is often mobile and often locally focused. For example, when I went to New Jersey for dinner, my smartphone knew where I was physical. When I was looking for a restaurant, my phone picked up where I was, and the search results for the restaurants were all in New Jersey. Because they are more conversational, voice search queries are typically longer than search queries for typical text keywords. It is important to remember that the goal of these new technologies is that the device offers the best results for moving search engines. To do this, the devices attempt to find fragments of easily identifiable, short and relevant content to refer to the search engine. Here are some tips for optimizing voice search. According to the Internet Trends Report 2016, people are using voice search for a variety of searches. It is estimated that 22 percent search comes for local content and information like local businesses (such as agencies providing SEO services, restaurants, cafes, etc.) So we should start strategizing for local voice search. If you have not already created your Google My Business list, what are you waiting for? Is the time! Claiming and optimizing Google My Business is a great way for Google to find more information about your business, such as business category, address, phone number, business hours, and more. As we know, many voice searches done are local in nature, so creating or listing your business in Google My Business listings can increase your chances of appearing when searching for your business, location, or location. Your local industry. Now keywords are not just keywords anymore. The keywords in the world of voice search are long tail +. The “plus” refers to the conversation phrases you need to add when searching for the conversation voice. Your keyword strategy should now be more conversational and mimic how real people talk and ask questions verbally. Think about the types of questions you receive when customers call you to ask questions about your business and then begin to document and record the exact words they use when talking to their customer service representatives. Once you’ve shortlisted questions and solutions for your customers to be received by phone, you can start creating content pages that focus on longer, more conversational keywords. A great way to use the above customer data is to create FAQ pages that focus on those long keyword phrases. Try to group the most common questions on the same page. Look for natural-sounding questions and phrases instead of the old SEO keyword phrases you’re probably used to. If you need to create several different pages for voice search technologies to have a better chance of retrieving information from your website, go for it! Expect more direct queries from search engines. Search queries like “best DSLR camera” will fade and hyper-specific searches will become more popular. For Example: “Ok Google, where can I find the best DSLR waterproof camera that works with Facebook Live?” You should Suggest short and concise answers for these type of questions asked by voice seekers. This seems to be an overwhelming task, but creating these individual pages and content fragments that focus on specific semantic questions that people face can not only help your site in the voice search results but also increase your chances of appearing on Google’s Star Fragment”. Use structured markup data (using the appropriate schemas) to give these voice search devices even more information about your website and content. Schema.org’s structured data markup is critical to your website because it defines more specific information and makes it easier for search engines to accurately analyze your content and understand its context. It’s a new world for SEO! Voice search is in the hot trending list and not going away. It’s time for every marketer to start optimizing their websites to this new enhanced world of voice search — so they’re not left behind the trends. Why iOS Developers are moving to Swift?